Brother Ali was my hip hop discovery of 2004, with the "Champion" EP and the "Shadows In the Sun" album from the previous year (check my review in french). A perfect combination of brilliant production by Ant (from Atmosphere) and flowing stories by the albinos rapper. Last year when I heard the roofblower "Original King", freely offered for download on various websites, I started hunting for information on a new album ("The Undisputed Truth", out April 10th), in order to get myself a new nicely sounding piece of wax and be able to play it on parisdjs.... and I stumbled upon this upcoming single (released earlier this january), available for download on Brother Ali's myspace page (for example). So my upcoming bomb was in fact "just" an exclusive b-side! What's the story there??? was I asking myself when I started my mp3 player with "Truth Is"... Bing! bang! badaboum! "but this one's even better!!! gimme more gimme more I want more!!". That's just a real bomb. In'yo face hip hop anthem for the masses. On January 9, 2007 the 12 inch was released with both tracks and a third one, "Freedom Ain't Free", more of the late-night home affairs kind. I called my hip hop store to reserve my copy. Note : All tracks produced by Ant. All songs except "Original King" from the upcoming album "The Undisputed Truth", to be released April, 10th. Brother Ali has no reservations in saying that he's "trying to be one of the greatest of all time" (on the Molemen track "Life Sentence"). Inspired by golden era legends like KRS-One and Rakim, this undisputed Master of Ceremony began rapping as a means of survival. Growing up albino (colorless hair, skin and eyes, poor vision, and extreme sensitivity to the sun) in a world of cruel kids made it strikingly obvious to Ali that he needed a high-powered way to earn some respect and prestige among his peers. As a result, every since elementary school he hasn't slowed down with his lyrical grind. In his rare moments of silence these days, if you catch his eyes, you'll notice that this Minneapolis denizen is rapping in his head. For Ali, hip-hop doesn't stop when he exits the studio or stage. Around the turn of the millennium, Rhymesayers Entertainment couldn't overlook Ali's talent and drive when he submitted his self-produced demo, Rites of Passage. This rare, cassette-only effort features collections of rhymes, poems, and stories that he wove into his live sets. Its release help make him a welcome member of the RSE family alongside Atmosphere, Musab, and Eyedea and Abilities. Before returning to the lab, Ali kicked his way onto the battle circuit and even wound up facing off with fellow RSE rep Eyedea at the 2000 Scribble Jam festival in Cincinnati. Ali beat battle champ Eyedea, but didn't take home the trophy. Nonetheless, the MC collected his props and headed back to the Twin Cities, ready to record his official debut, Shadows On The Sun. By no means a mixtape act, Ali focuses his energies on making complete records that will stand the test of time. This became clear on Shadows, the album that left critics and hip-hop kids alike stunned. As the Village Voice raved, "When Ali raps…I can't do anything but sit and stare at my stereo, engrossed by the raw emotion and tricky wordplay." Released in the spring of 2003, this breakout effort produced by ANT of Atmosphere saw Ali present himself as a "modern urban Normal Rockwell" who's a "cross between John Gotti and Mahatma Gandhi." 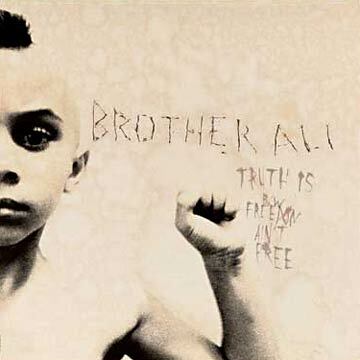 Indeed, Ali painted vivid portraits of inner city plight on the fiery single "Room With A View" and showed the world that you can stand your ground without always resorting to violence on the uplifting track, "Win Some Lose Some". Since the release of Shadows, Ali has become just as revered for his performances, in which the MC takes audiences through heavy passionate ballads to high-energy crescendos and back. Among his 500-plus shows, Ali has shared stages with the likes of Atmosphere, Brand Nubian, Rakim, MF Doom, and Murs throughout the U.S., Canada, Europe, Japan, South Korea, Australia, and New Zealand. And he hasn't been limited to playing clubs and concert halls as he has participated in renowned music festivals like Coachella, Sweden's Hultsfred and the Eurokeenes Festival in France. During down time from touring, Ali returned to the studio with ANT to build off the chemistry sparked on Shadows to craft the Champion EP. While brief, this mini-album is an expansive effort that sees Ali express himself through everything from classic braggadocio ("Bad Ma Fucka") to poignant societal examinations ("Chain Link"). Following the release of Champion in the spring of 2004, Ali ran into a number of roadblocks that halted his usually steady recording process. This included him parting ways with his wife, being homeless, and trying to secure custody of his son. Armed with a wave of stories to share, Ali recorded The Undisputed Truth, once again with ANT in his corner. Due out Spring 2007 on Rhymesayers, Ali's second full-length sees him dig deeper into his life experiences ("Walking Away") and political views ("Uncle Sam Goddamn") than ever before. "I wanted to make an album that gives you no choice but to feel what I'm feeling at the time," Ali explains of The Undisputed Truth. "I made choices that sent me through a lot of struggle in the past few years and ANT and I have made music that really communicates the exact feeling of those situations." As he ponders, "How does it feel to have to walk away from a ten-year marriage with a child? You got a six-year-old boy and he's your life. How does it feel to look him in the eye and explain to him that you're breaking up his home? The music and the sound of my voice and the way I'm describing the situations and emotions involved should make you feel like you're in my shoes at that moment. That's The Undisputed Truth."